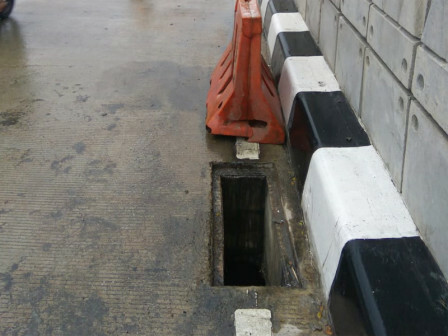 Steel grating for drainage on Mampang-Kuningan Underpass, South Jakarta is stolen again.
" Soon, we will report it to police"
Recently, steel grating on the west side of Underpass is missing. Jakarta Bina Marga Dept. plans to report this case to police. Acting Jakarta Bina Marga Dept. Head, Heru Suwondo mentioned, his side plans to report this case to police as soon as possible. Considering steel grating theft has occurred three times on the location. "Soon, we will report it to police," he affirmed, Thursday (8/23). Currently, his side is ordering new steel grating to replace the missing grating. While its installation becomes a part of contractor's responsibilities because it is still in maintenance period. "Steel grating must be ordered first. We hope this process can finish quickly thus it will not endanger anyone," he explained. According to him, there are 12 Closed Circuit Television (CCTV) units on Mampang-Kuningan Underpass. "We have 12 CCTVs," he added. For information, steel grating theft has occurred three times. First it is happened on May 31, 2018. Then second is on June 22, 2018 and lastly on Wednesday (8/22).